…Live online video streaming of the gentling process. 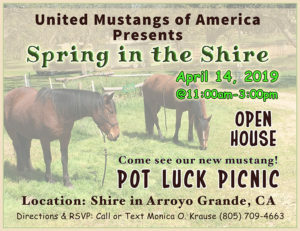 Description: We will be setting up live webcams to record Monica O. Krause working with the mustang in the corral. Access: To have access to the Extreme Mustang Makeover live gentling demonstration event, please choose any of the awesome sponsor options below. What to expect: Sometime next week, prior to the event on Sunday, we will send out an email with online viewing instructions. Got any questions? We are here for you. Please call 805.709.4663 or email UnitedMustangsOfAmerica@gmail.com. PS. Just want to sponsor Monica O. Krause and not participate in the broadcast event? You may do so by clicking on the Paypal “Buy Now” button anyway. Just ignore the live streaming instruction emails 🙂 You are very much appreciated. Want to name Monica’s EMM Mustang?